Victor Thorn (1962-2016) founded Sisyphus Press in the fall of 2000. He is the author of 54 different works, including 30 books, 19 chapbooks, as well as five anthologies which he served as editor. He has published the works of numerous writers in the alternative media such as Michael Collins Piper, Adam Gorightly, Lisa Guliani, Mark Glenn, John Kaminski, Joan d’Arc, Pete Papaherakles, Carl Robinson, and Pat Shannan, while also producing five CD-ROMs and DVDs, one of which is a five-disc collection that covers the John F. Kennedy Assassination (Evidence of Revision). Thorn’s political articles have appeared in various newspapers around the country. He has also freelanced for magazines such as Paranoia and The Barnes Review. In February 2001, Thorn founded Babel magazine, an online publication that ran until early 2004 and featured some of the first articles devoted to the 9/11 conspiracy. One of his books, The New World Order Exposed, was translated and published in Japan in 2006, while 9/11 on Trial has been republished by Progressive Press, and was also released in France to coincide with the fifth anniversary of 9/11. After co-hosting The Victor Thorn Show on the Reality Radio Network from 2002-2003, in February 2004 he co-founded WING TV (World Independent News Group), a daily Internet television and radio talk show viewed in over 100 countries worldwide. In addition, he was a weekly investigative reporter for American Free Press from 2007 until his death in 2016, while serving as AFP’s assignment editor in 2011. Thorn was an avid political activist who spoke at the OKC Bombing 10th anniversary, as well as before the America First Party. 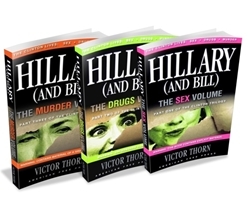 He also protested in six different states, not to mention at Ground Zero on several occasions, and in front of the White House in Washington, D.C.
Victor Thorn’s thouroughly researched trilogy (which was credited as a source in Roger Stone’s book, The Clintons’ War On Women) is a gripping read. Who Was Bill Clinton’s Real Father? 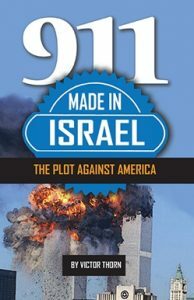 What this book makes clear is that a massive coverup exists not only in the mainstream media, but in the so-called 9/11 truth movement as well. It is true that 9/11 was an “inside” job, and criminal elements within the U.S. government were undoubtedly involved, as is so often stated by many authors and activists. But 9/11 was much more. It was an “outside” job also, ultimately made in Israel,as a mountain of evidence compiled in this new, landmark book clearly shows. 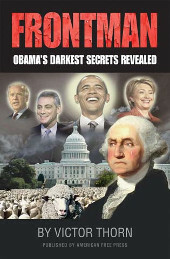 This book sets the record straight by focusing on the actual puppetmasters. Jewish control of World Trade Center security and Jewish ownership of the WTC complex is only one piece of the 9/11 puzzle that Thorn meticulously pieces together. Only one nation and group of people benefited most from the attacks on 9/11: Israel and its Zionist allies. Considering the fact that the rogue state of Israel has a prior criminal record of perpetrating just such a crime—the June 8, 1967 attack on the USS Liberty—the verdict in this case is clear: 9/11 was made in Israel. The HIDDEN FACTS behind the COVER-UPS: The uncensored TRUTH about the highest-profile MURDERS in world history . . . The stories behind the headlines that made news across the globe. Murderers, hit men, guru cult leaders, school shooters, and cold-blooded political killers . . . 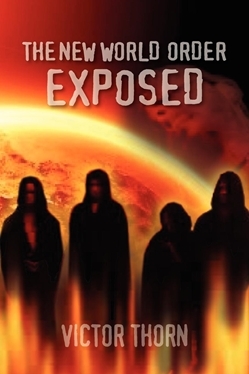 In this latest exposé by AMERICAN FREE PRESS’s no-holds-barred investigative reporter Victor Thorn, 16 of the most high-profile cases that have shocked citizens in America (and the world) for the past 50 years are tackled. We guarantee you have never seen this information assembled in one book before! 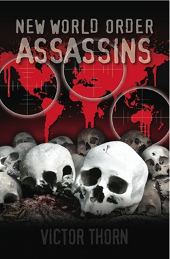 NEW WORLD ORDER ASSASSINS delves into the sordid details that had previously been suppressed by official government sources and the mainstream media. More importantly, Thorn reaches conclusions that far transcend even those compiled by other conspiracy researchers. The results will make readers reevaluate not only these pivotal events of history, but also the forces that don’t shy away from bloodshed, orchestrating the deaths of presidents, politicians and public figures—all to further their nefarious agendas. Dangerous information the historians “forgot” to reveal . . . In other challenging works, Victor Thorn has chronicled the inside story of 9/11, the Waco massacre, the Oklahoma City bombing fraud, the victims of the Clinton body count, the inside story of Jonestown, and the USSLiberty massacre. Now, Thorn uncovers a treasure trove of forbidden history in a new book that shakes the foundation of our popular culture. . . .
Be prepared to spiral down a rabbit hole that delves even deeper into a realm that most people don’t even know exists. NEW WORLD ORDER ASSASSINS teems with long-lost secrets that Big Brother thought he’d flushed down the Memory Hole. In an age of increased political correctness, Thorn isn’t afraid to address taboo subjects or slaughter the government’s most cherished sacred cows. . . . In 2008, Barack Obama became the face of hope and change. Yet lurking behind the scenes is a host of personages who long ago selected this man to forward their global agenda. Frontman reveals the actual powers behind his throne: Bilderberg plotters, Zionist handlers, global financiers and Marxist activists. Critics have called Obama an empty suit, but in actuality, the suit is filled by a cabal of men and women whose primary goal is to radically transform the United States. To cover their tracks, an air of secrecy has enveloped Obama’s past, including his birth records, college transcripts and employment history. While other books merely scratch the surface, Frontman tears away the deceptive smoke and mirrors that have been used to propel him into the Oval Office. By far the most comprehensive exposé to date, President Barack Obama can no longer hide behind a façade that had been carefully created and orchestrated over the past few decades by people who are still pulling his strings. The title says it all: America’s commander-in-chief is merely a figurehead for much more powerful people and forces. Now, at long last, one of the most brutally honest portraits ever presented shows how our nation is being controlled by unseen hands that are leading us perilously close to disaster. 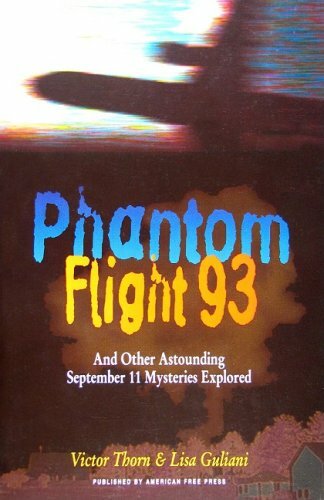 There are lots of books out surrounding 9-11, but this is the only book telling the real truth on Flight 93 . . . and it’s a trailblazer! In this amazing book, Victor Thorn and Lisa Guliani unveil the facts that demonstrate beyond any doubt that federal authorities and their allied propagandists in Hollywood and the mass media have deliberately told fantastic lies regarding the disappearance from the radar of United Airlines Flight 93 on September 11, 2001. We’ve been told that UA Flight 93 crashed in Pennsylvania farm country after a struggle aboard between passengers and the reported Muslim hijackers who had taken over the plane, but don’t believe it. The legend of the heroic rebel passengers who took on the terrorists may (or may not) be rooted in reality, but there’s much more to the story than you’re supposed to know. This is the one and only book focusing on Flight 93, amidst a plethora of books relating to 9-11, and when you’ve finished this, you’ll join Victor and Lisa in rejecting what the government has told us. For far too long, the ambiguities surrounding Flight 93 have been overlooked by many independent researchers who have accepted the story that the plane crashed when kidnapped passengers rebelled against the hijackers said to have taken over the plane. In fact, as Victor and Lisa demonstrate, there’s even some question as to whether the plane actually crashed at the location where the government says it did. And that’s just the beginning. Phantom Flight 93 also explores other mysteries related to the horrifying day when life in America changed forever. You can find this book here. There’s nothing new about the New World Order. It is a conspiracy—not a conspiracy theory—and its very roots can be found in the Garden of Eden. Today those who are tilling this soil for their own insidious ends are in positions of power in government, the media and in academia. In order to comprehend the nature of this monster—this enemy of liberty—you need to read and understand Victor Thorn’s The New World Order Exposed. Finally, the veil of illusion has been lifted by one of the most comprehensive books ever written about the New World Order. Now everyone can see beyond the conditioning and lies perpetuated by our political leaders and their mainstream media minions. If you want one reference book that you’ll return to day-after-day and year-after-year, open the front cover of The New World Order Exposed and you’ll begin to discover how the world really works. This book will shock, unsettle and enrage you but, in the end, the truth will set you free. If you are fed up with the status quo and feel as if you’re not being given the full picture, take the first step: read this book. Like a reality bomb, it will forever change your perspective on the world in which we live. 3) Military Smokescreen: Who Commanded the Air Force to ’stand down’? 21) Who Controls the Federal Reserve System? 34) Why Did Americans Finance the Bolshevik Revolution? 43) Jonestown: Mass Suicide, or Massacre? 47) Who Controls the American Presidency? 53) Why Doesn’t the Media Tell Us About the Bilderbergs? 66) Do We Care Enough To Save America? Copyright © 2018 American Free Press, All Rights Reserved.